I know fall is over, but I still have some pumpkin to use up. 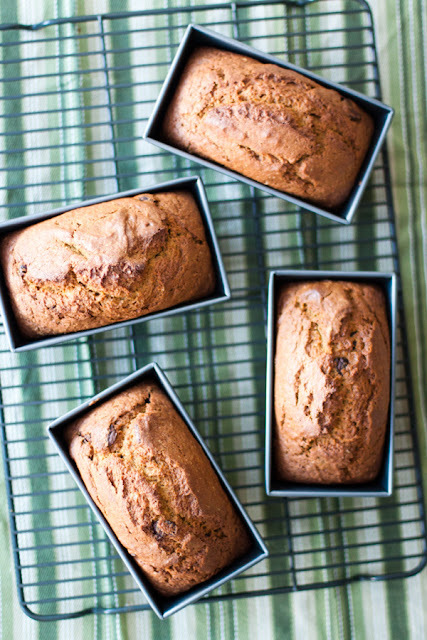 Plus, nothing beats the smell of pumpkin and spices baking in your kitchen. NOTHING! Heat oven to 350. Butter & flour 4 mini loaf pans. Mix flour, sugar, soda, salt, cinnamon, nutmeg, cloves & baking powder. Add pumpkin, applesauce, eggs & chocolate chips. Stir until combined and smooth. Pour into pans and bake for 60 minutes.